Home » BJJ Competition » Should I compete in Brazilian Jiu-Jitsu tournaments as a white belt? 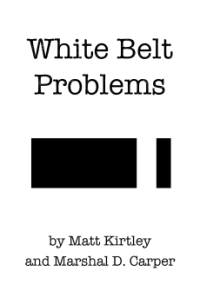 If you plan to compete at all, then white belt is a great time to do it. No one takes the white belt division too seriously (aside from the white belts themselves), and you will be under less pressure to win or prove yourself. Competing certainly doesn’t get any easier as you rise up the belt ranks. Most people get very anxious and nervous before they compete, and unfortunately for them, the best way to deal with those feelings is keep competing until they’re used to it. The nervousness may never go away entirely, but you’ll learn to deal with it. See How do I deal with being anxious and nervous before a BJJ competition? for more advice. You’ll need to get used to many other aspects of competing, like tournament registration, making weight, weighing in, knowing where to be and when to be ready for your matches, following referee instructions, reading brackets, and all the other things that come up while competing. You’ll want to get familiar with all of that before the stakes are too high. Even if you don’t plan to be a serious competitor, I recommend you compete at least once or twice. Preparing to compete gives your training a sharp focus, helping you refine what you know and identify your strengths and weaknesses. The stress of a tournament match against an unknown opponent is hard to recreate in normal classes, and having that experience is important even if your motivation for training is self defense. Win or lose, you will learn a lot from competing. You can get more tips here: How do I get ready for my first BJJ tournament? What are the rules of a BJJ tournament? What techniques are illegal in BJJ?